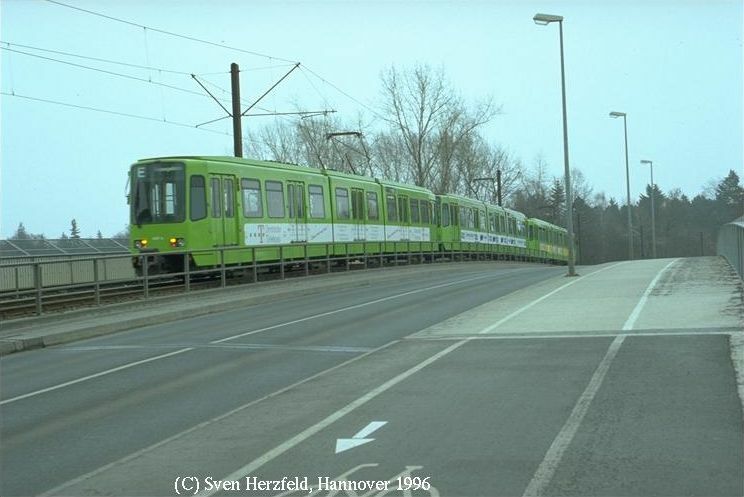 In the summer of 2000 the possibilty arose to aquire good quality second-hand rolling stock surplus to the requirements of Hannover after the Expo there. 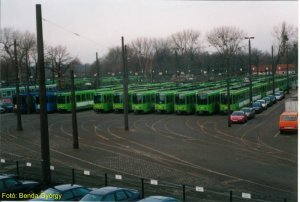 The vehicles were 70 TW6000 type trams from ÜSTRA (Hannover Transport Company) which the company has made available for purchase. Hannover will continue to operate this type in service, it is merely getting rid of it's surplus - this gives a guarantee of kinds that these are well designed and efficient vehicles and that spare parts will be available for some time to come. 2 cars have already been sold to Holland meaning that currently 68 TW6000's are available. 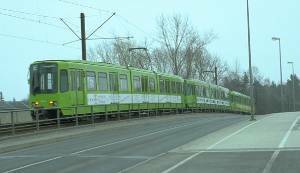 There is also talk that, with the closure of the CEBIT exhibition, a further 15 cars will become available. On February 22nd, the Budapest City Council - in the middle of political turmoil - voted to set aside the 7 billion forints needed to purchase the 68 cars. This shows that the price for these cars is just a pittance of the ammount needed for a brand-new fleet of low-floor fully-accessible trams. However, in the following weeks' the purchase of the cars was still announced by the politicians as being uncertain. at low-height platforms integral steps open up. 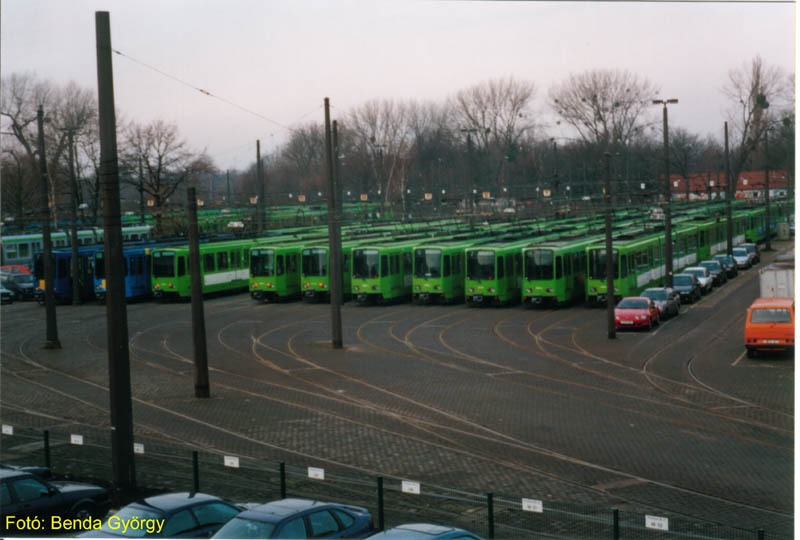 1 -This type of motor is widely used in other Trams and Trolleybuses. 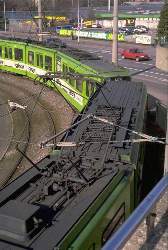 2 - The tram re-generates power to the system within these Voltages. If the voltage is lower than this, the system regards it as a shorting hazard and does not attempt re-generation. ; at voltages higher than these, the system is unable to handle the re-generated power. 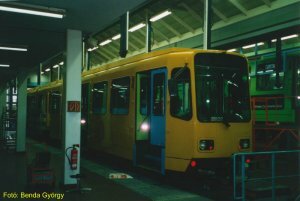 On some cars, this was changed to 640-800V: These cars' fleetnumbers are displayed with a an orange line through them. It is advisable only to couple other similarly updated cars to them. The TW6000s were built between 1974 and 1993, 260 cars were built altogether numbered from 6001-6260. The first 100 cars were built by DÜWAG with Kiepe and AEG (now Siemens) fittings. Later cars were built by the Southern German Linke-Hofmann-Busch company. 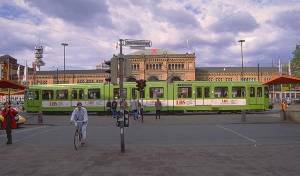 A three-car coupled, 84m long set of TW6000s - these sets run on Hannover Market days. 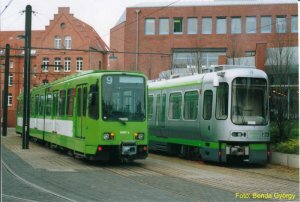 In Hannover, these cars are Trams, light-rail behicles and Metros rolled into one: The integrated network easily allows for massive growth in passenger numbers - Hannover Market days being an example. The light, integral pipe-shaped structure of the cars gives passengers great protection in the event of a collision. 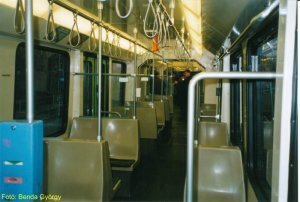 The dual-directional, articualted cars with doors on both sides has allowed the creation of a roomy, spacious travel environment for passengers. Car 6091 on a special working in the underground Hauptbahnhof Station. 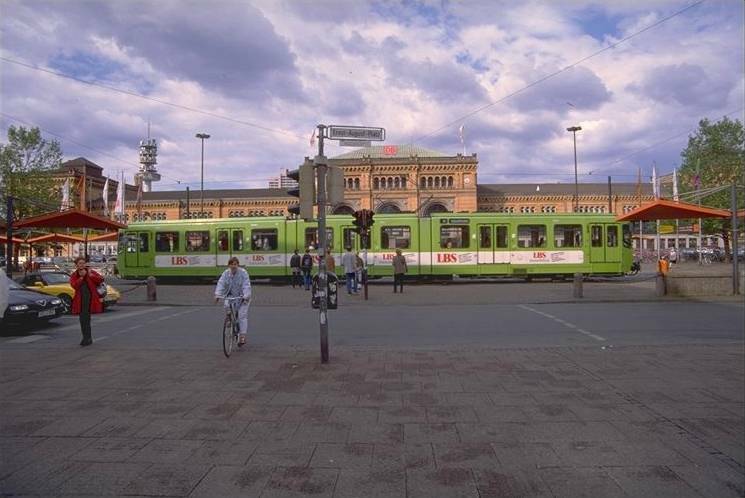 As the TW6000 was designed with many different types of operation in mind, they are suitable for high-platform suburban and also underground Metro stations, as well as for conventional low-platform tram stops. The doors of the cars were designed along these lines. 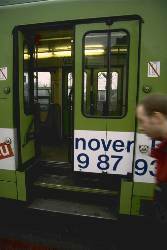 At low-platform stops, the section of floor by the doors lowers down with the help of the motors, to produce one step; the second step is created by the bodyside skirt, which is pulled in underneath the car. At high platform stops, this does not happen - allowing for platform-height boarding and alighting, meaning daster loading. The doors are controlled either by the driver, or by passengers using a button - therefore the doors can be closed by either passengers or the driver. At high platforms, if someone becomes trapped in a closing door - the door automatically reopens. 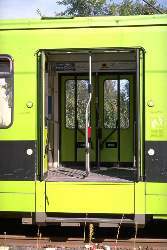 On the bodysides, door-open buttons are placed at two heights to cater for the differing platform heights (both work at any time). On the door grabrail - a light beam is fitted: The door buttons only work if there is no-one in the doors. 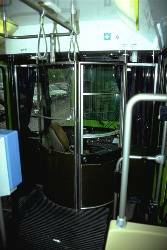 The main reason for it's fitment is that the step-motors are not designed for the liftin of passengers - if this happened, the motor fuses would blow, meaning the step could not retract again if someone was trapped. The cars brake automatically if any of the doors open when in motion. The 'front' doors can be opened seperately on either side. Doors cannot be opened on both sides at once. The cars are fitted with 1400 x 1100mm slider fitted windows made of safety glass, these provide adequate vetilation for their home climate. 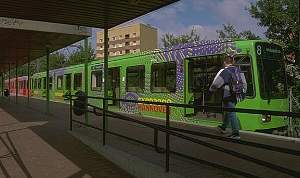 The opening area, should transfer to Hungary take place, would be enlarged to Hungarian measures in the Hannover workshops. The passenger area of the cars is made up of rows of 2+1 plastic seats, with a light-brown interior. Lighting is 220 V Flourescent tubes. Care has been taken to provide a quiet travelling environment, the large ammount of plastic fittings and seats has helped reduce noise too. In the lockers under the seats are the electrics, the heaters (which would be a great step forward compared to the current state of Budapests' trams) as well as the sanding systems above the driven bogies. The sanding systems can be filled from the outside, through an access point by the doors, or, alternatively from the inside. The inside. Quite simple, but functional and sturdy. In Germany there are laws regarding the design of Trams and Public Service Vehicles: the specs of the trams therefore comply with the VÖV, VDE and BOStrab rulings. These rules cover such things as ergonomic drivers cabs. The cabs are fitted with seperate heating systems, demisters and overhead ventilation. The windscreen is lightly rounded and reaches up to the roof. 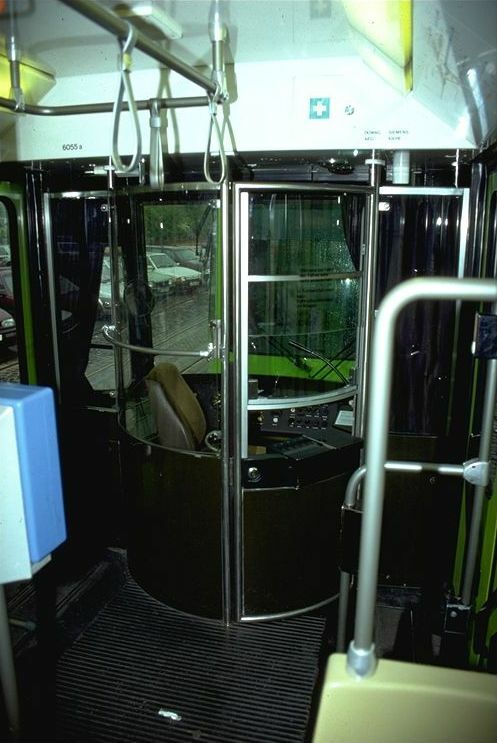 The cars can also be fitted with automatic station announcements: this is a common cassete-tape player which could be used to play music tapes (and is used as such at times like New Year or on Staff Transport). The only difference is, if there is a break of longer than 6 seconds in the music - the casstette player automatically turns off! 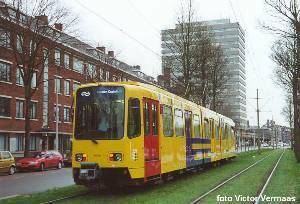 Interestingly, the trams are fitted with an accesory quite common in western europe - electrically operated mirrors - but only on the right hand side. These open out when the cab is activated. 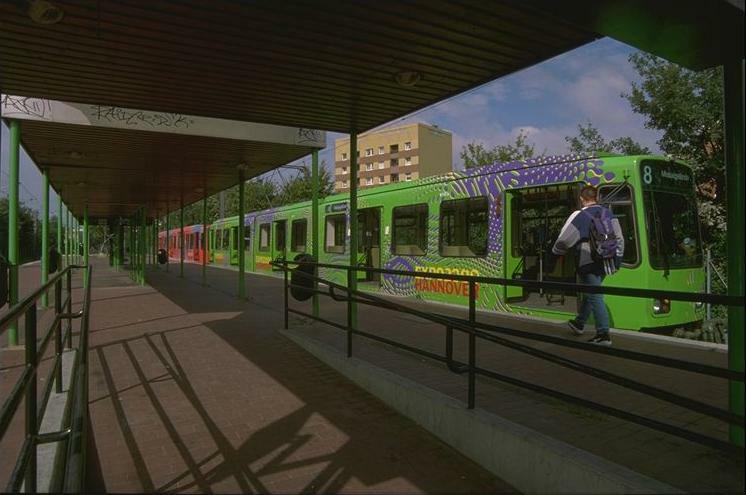 In Budapest, a mirror is also required on the left-hand side - Hannover workshops will also fit these. 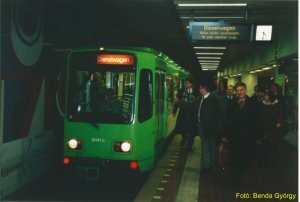 The cars are fitted with front and side electronic blind displays. 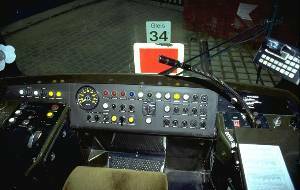 The cars were designed at the time when thyristor - chopper controls were being introduced. The cars are energy efficient, when braking, the energy released is pumped back into the system (saving 20-30% of the power that would normally be needed) and also at start when the car uses the minimum ammount of power. The two parts of the car use seperate thyristor loops - in an emergency the car can be moved with just one motor working. The fuseboxes are kept in the centre section under the floor. Automatic anti-jerking operates within the controller: The maximum speed at which secondary pull can take place is 1.1m/sł (Meaning the tram reaches maximum pull power after only 0.9 seconds). The electrics for the controllers are also kept under the floor of the centre section - the electronics also keep a check on the cars' loadings as well as helping prevent skidding or wheelspinning.3. 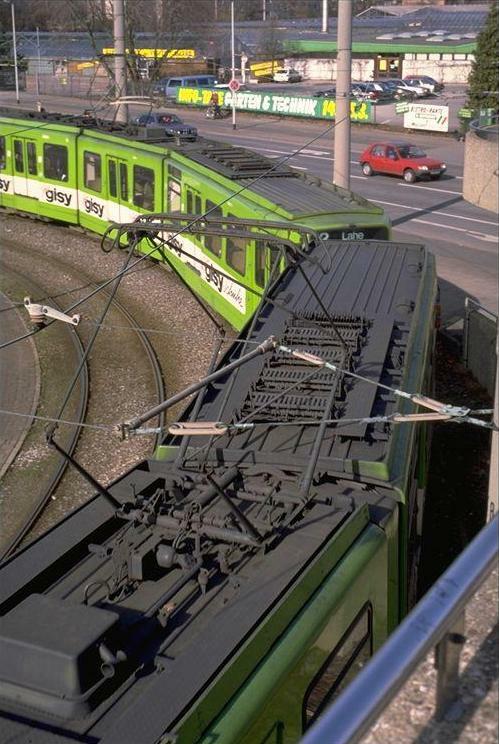 The cars are fitted with semi-automatic Scharfenberg couplings4. These connect cars both electrically and physically. The cars' bogies are of the type used a lot by DÜWAG and are of a drive-trainless design - each bogie having it's own monomotor. The DC Motor fits between the two axles. 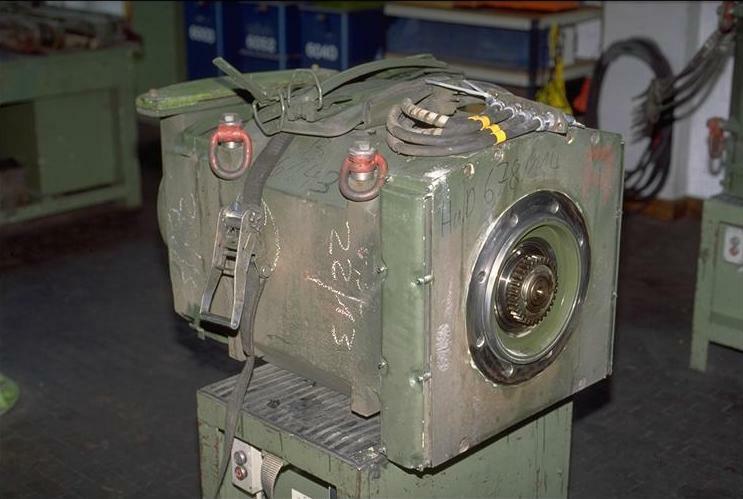 It is amazing that, even though they are of small size, their output is something like 4 times that of the motors fitted to Budapest UV types. The cars' suspension was solved using a combination of rubber springs: Main suspension is provided by rubber/steel springs, with secondary suspension provided by another set of rubber springs. 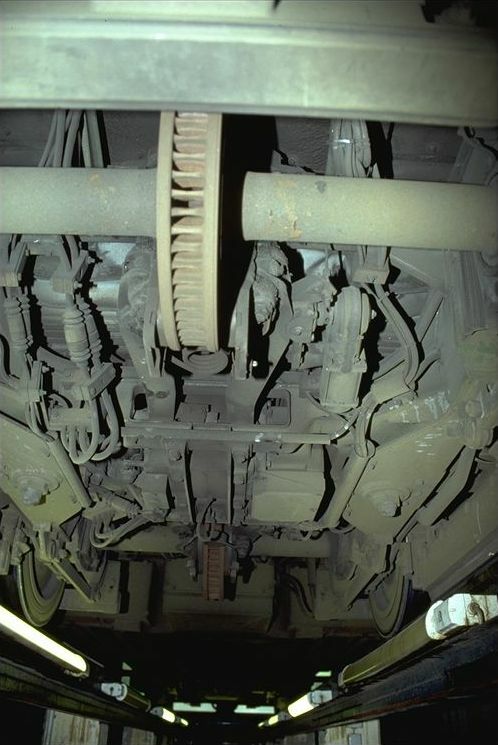 Any horizontal motion, such as pulling away, or braking is seen to by the secondary suspension whcih transmits the motion between the body and bogie. Alongside these are interconnected shock absorbers. 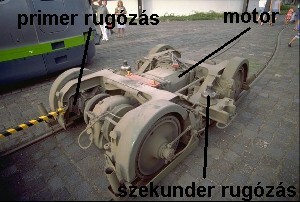 On the picture (right) the cross member that sits on top of the secondary springs (marked 'Szekunder rugózás') is missing and it is this that the tram body, with the aid of a ball-bearing mounting pivot, sits on. 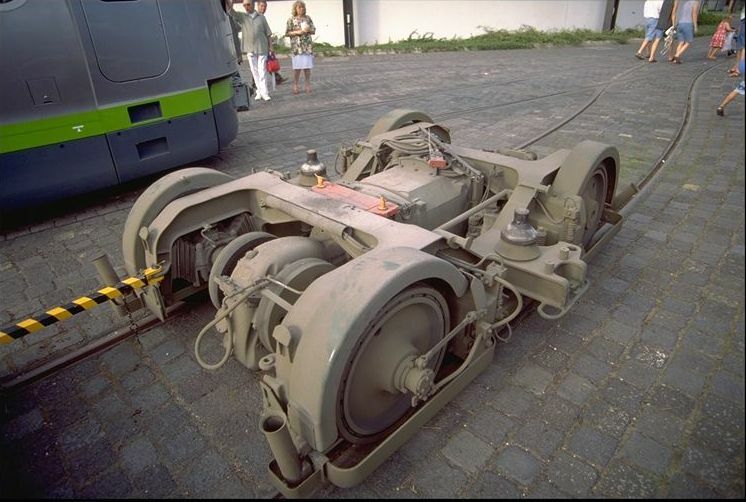 It is with this innovation that the King Pivot could be done away with, releasing space for the motor in the centre of the truck. As backup, rail brakes are also fitted 2-2 per bogie. In the interests of skid prevention, sanding is done automatically - but in tunnels, the trams are reset automatically to use rail brakes. In an emergency, however, sanding is till possbile. There's space here... 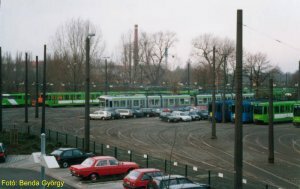 The Üstra depot yard. 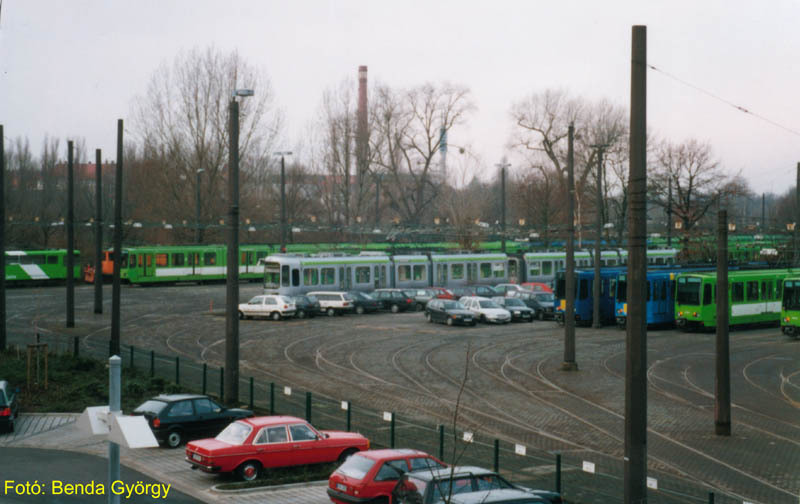 The continuation of the depot yard with the unused cars. These would be the ones heading to Budapest. The cars are of the older 6xxx batch. This yellow beast in the ÜSTRA workshops was bound for The Hague. Test tram 6021 in The Hague. 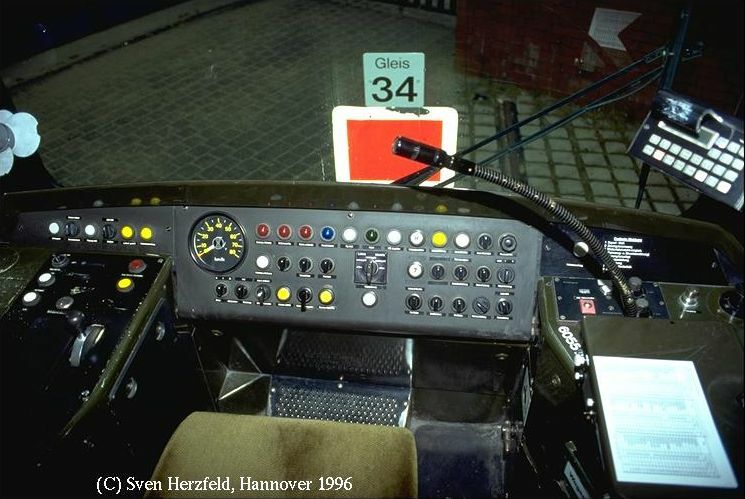 Sven Herzfeld's pictures were found on the Mercurio Tram Picture Gallery. Further Technical information can be found on his homepage, this page was created using data mainly from his site.